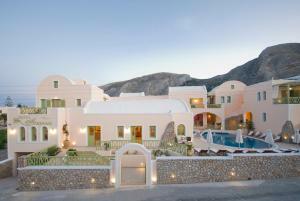 The Anassa Deluxe Suites is 70 meters from the beach of Kamari. This 4 Star hotel offers spacious and independent accommodation options, with furnished living area and balcony overlooking the gardens or pool. 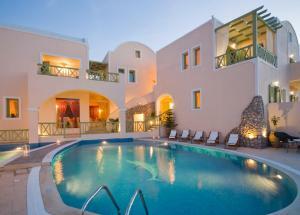 Spacious suite with an elegant living room and a luxurious bathroom with a spa bath. The private balcony overlooks the pool or the garden. Studio with balcony and views. It has a kitchenette, free Wi-Fi access and a spa bath. 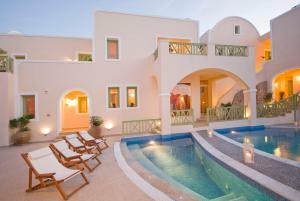 This family suite has 2 bedrooms, a living area, a fully equipped kitchen, a bathroom with a spa bath and 2 balconies. Spacious suite of 2 levels with a second bedroom in the attic. Its luxurious bathroom incorporates a hot tub. This spacious studio is located on the ground floor and features a kitchenette, a private balcony and facilities for disabled guests. Suite with a balcony, bathrobe and minibar.